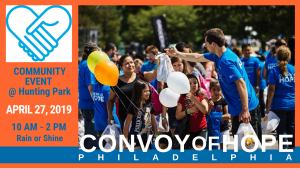 Convoy of Hope Philadelphia will be held at Hunting Park this year on Saturday, April 27th, rain or shine, 10 AM to 2 PM. This is a free Community Event where Convoy of Hope joins with area churches to provide: free groceries, meals, health and dental screenings, haircuts, family portraits, children’s activities, prayer, and so much more! To volunteer to help at this event or to make a donation, go to: convoyofhope.org/philadelphia.